I was hoping to start off the challenge strong, but this week ended up just being prep and shopping time. At least I finally got a drywall guy to come out and give me an estimate - it’s only been three years in the making…Anyway, I liked him and thought the estimate was reasonable, so I scheduled him to come out on the 21st. I was hoping to have it done sooner, but that was the earliest available appointment. I originally didn’t plan to paint until the drywall was complete, but now I’m thinking I better get started before 21st or I’m not going to have much time to install everything. I don’t know if that will really happen or not, but I figured I should pick a paint color so I’m ready to go whenever the motivation strikes. I want a really pale blue color on the walls (white on the ceiling, trim, and doors), so I grabbed some paint cards while I was at Home Depot. I’ve narrowed it down to two choices. I’m think I’m going to grab a couple test pots next time I’m there before I make the final decision. Speaking of Home Depot, I bought a light fixture! 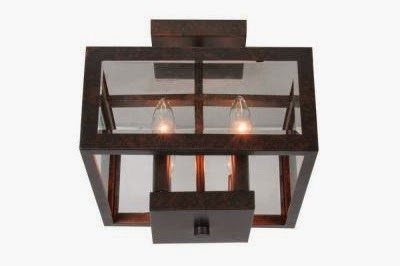 I was originally planning on this Moroccan drum-shaped one, but ended up buying this square glass fixture instead. I really liked both of them and couldn’t decide, so I asked my boyfriend to pick. Of course I was happy either way, but I do like that this one was $15 cheaper than the other one. I also ordered this set of safety pins from Ballard Designs while they were having a 20%-off sale. I tried to find a cheaper set elsewhere, but these ended up being the best deal. If you are in the market for just one safety pin, I found them at Hobby Lobby and online here, but they only come in one design. I liked the three in different styles, so I went with the ones from Ballard Designs. As for the rest of the items, I ordered the Laundry Today or Naked Tomorrow vinyl from Etsy a few years ago…seriously, it’s still sitting in the box it was shipped in. Now I just need to find a board to hang it on. I also ordered this ironing board holder from Amazon. So, I can’t cross anything off my to-do list this week. I’m planning to paint the ceiling, door, and trim by next week. Plus I want to hang my new light fixture…and maybe start painting? Don’t forget to stop by Calling It Home and check out everyone else’s second week progress! Love the laundry today or naked tomorrow! How clever! 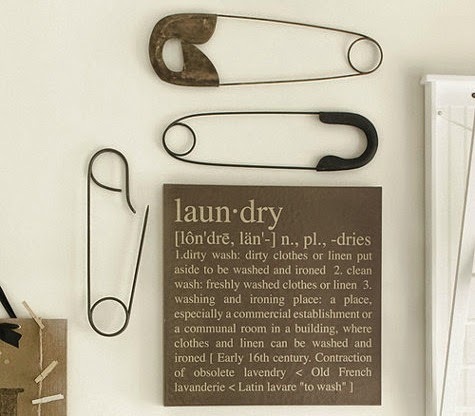 I've been eyeing those safety pins from Ballard Designs for a while and would love to have a laundry room to fully display them! So fun! I like the light fixture too, very modern and cool design. Looking forward to seeing what you have in store next. The safety pins arrived in the mail yesterday and they are amazing in person! They were a lot bigger than I expected and I love that they actually open! I can't wait to get the room painted so I can hang them up! I think planning, ordering items, scheduling appointments, and picking out paint is the hardest and most time consuming part! Once you have everything you want/need, it'll be easier (and more fun, in my opinion) to put it all together. 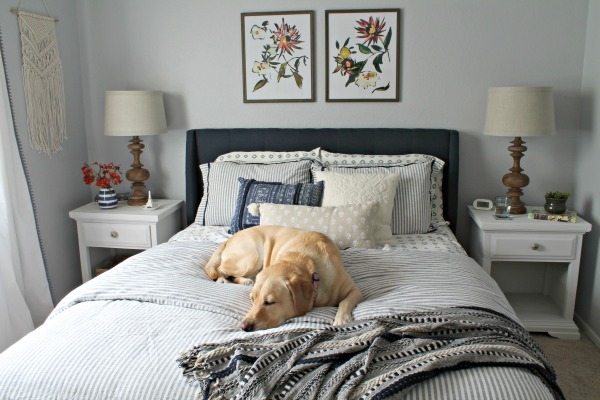 I love the light fixture and blue paint colors you have picked out. Can't wait to see it all come together! So true! I hate scheduling appointments...which is probably why I put it off for so long! Those safety pins are super cute! Cant wait to see your progress next week. I have those safety pins from BD...love them! Cant wait to see the finished product....love the plan! love the safety pins!! And they will look great with that light! I like the blue color on the top. And those safety pins are adorable! I have a drywall/painting deadline issue too so I decided I might as well get started with the painting sooner then later and save myself the stress! Hi Sam, it looks like you have most of your accessories on their way. Ahh, the dreaded paint chips, that can make anyone's blood pressure rise. Good luck this week. Can't believe I missed this post, must be the baby thing, anyhow, love the light fixture you got, cool and unique. Good luck with the paint choice, either way, your right in painting this space! I love those giant safety pins; super cute! 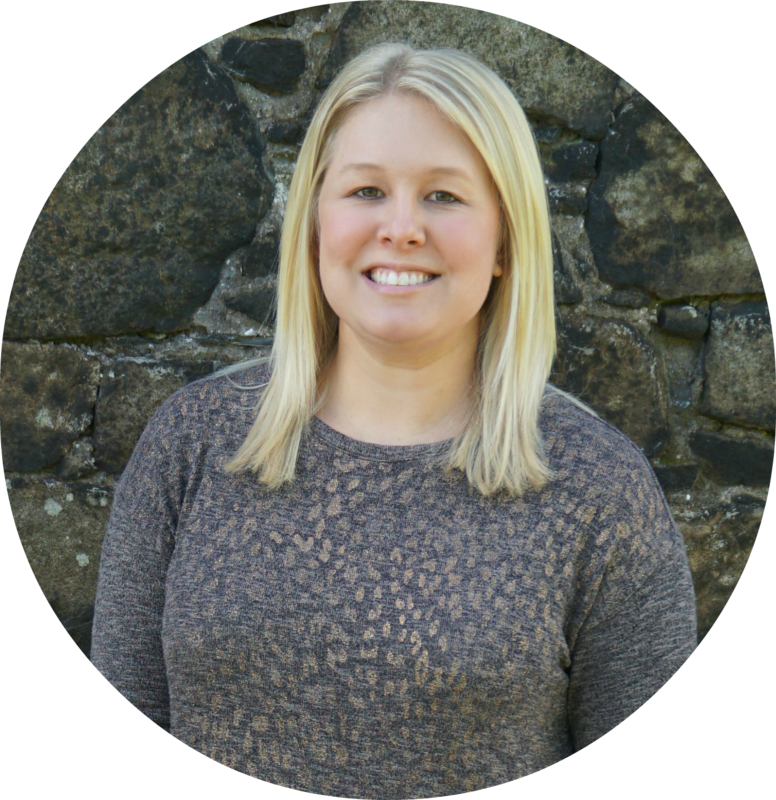 I can't wait to see your plans start coming together! I wish I could do something with my laundry room; it's so neglected. Since we're renting I can't paint it or anything but I keep thinking I should at least add a colorful rug in there or something to make it feel a little more fun. Can't wait to see what you do with yours!